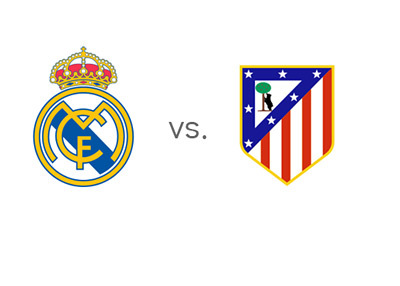 Real Madrid will host Atletico Madrid in the first leg of the Copa del Rey semi-finals on Wednesday, February 5th, 2014. Last year, in the finals, at Santiago Bernabeu, Atletico lifted the trophy after beating Real Madrid for the first time in fourteen years. Real Madrid are in fine form these days. They are third in the league, even on points with Barcelona and three behind Atletico. Luka Modric is playing well, Ronaldo is in form and Gareth Bale is looking to make a return to the line-up after a short injury break. Iker Casillas, who is Madrid's cup keeper these days, has not been scored on in the last six games. Since losing to Barcelona on October 26th, 2013, Los Blancos have not been defeated in twenty one games across all competitions. Atletico Madrid are a force to be reckoned with these days. They are first in the La Liga tables and they already beat Real at the Bernabeu earlier in the season. Thibaut Courtois is being huge on goal (no pun intended). Filipe Luis, Koke and Diego Costa are in awesome form as well. Atletico have only been defeated once this season across all competitions. They finished first in their UEFA Champions League group. They play the same line-up when they can, and they play the same attacking football every time. It is working for Diego Simeone and his men. On Wednesday, they will have to do without David Villa, who is out with an injury. Real Madrid are the favourites. A €100 bet on Carlo Ancelotti's team could return €85 in profit, while the same bet on Atletico could return €300 in profit. The most likely scorelines, according to the odds, are a 1-1 draw offered at 6/1 and a 1-0 victory for the hosts, offered at 7/1. Cristiano Ronaldo is the favourite to score at 4/5, followed by Diego Costa and Gareth Bale, who are both valued at 11/8. This should be a great game! Can Atletico win for the third time in a row at the Bernabeu? The kick-off is at 7:55 local time and the return leg is on Tuesday, February 11th.